Welcome to Kitsch and Fancy's Soap Shop! 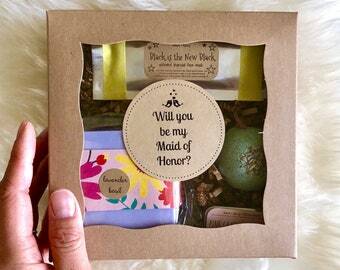 Specializing in gorgeous soaps for the home and personalized wedding and shower favors. I started kitsch + Fancy because of my love for creating and noticing the lack of beautifully packaged, feminine beauty products on the market. Your item from Kitsch + Fancy is 100% handmade and designed from beginning to end by a real life person, me! 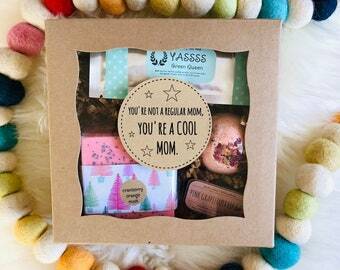 I design the products, come up with the sassy packaging, hand make every single item, and package it all with love before it leaves my sunny studio. The Kitsch + Fancy girl loves design, color, and femininity. A cozy home is just as important to her as the guests she has over. It's the little things in life that bring her joy. Something as simple as a lovely guest soap in a beautiful color makes her so happy. 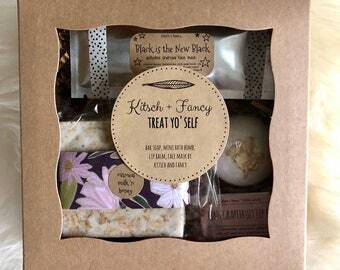 Kitsch + Fancy offers luxurious soaps, cute wedding and party favors, natural sugar scrubs-- things to pamper yourself or give as gifts for loved ones. It is a special way to indulge yourself and your loved ones. SO amazing. 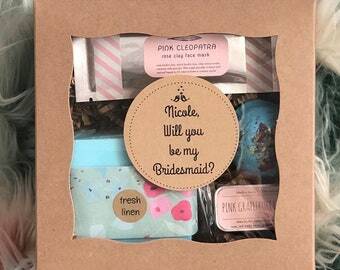 Got these for my girls for the big day! i bought this for a friend for her birthday and she LOVED it. 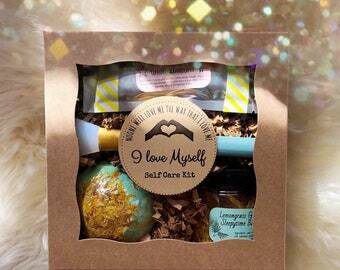 she said as soon as she opened the box it “smelled like love” and that the lip balm is “amaze balls”. 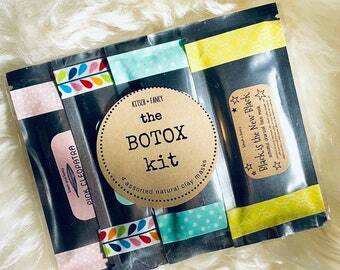 This tiny spa kit is the perfect Mothers Day gift and comes in three lovely scents! 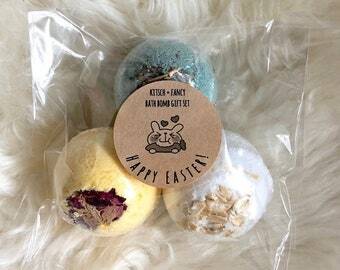 Easter themed gifts available for a limited time. I draw inspiration from my daily life, especially food and nature. Every part of the process from the brainstorming of a recipe to coming up with the perfect packaging is so important. 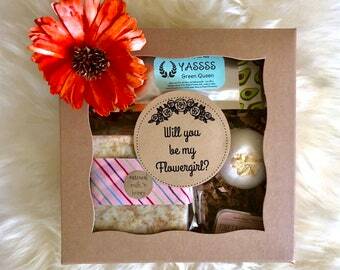 I love thinking that my items that are created with love are a part of someone's big day, a thoughtful gift, or treat! every item you purchase from kitsch + fancy is designed and made by one person.....me! 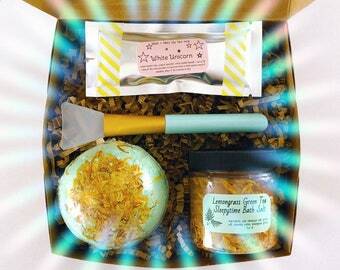 i spend my days designing labels, making soaps, packaging face masks, and packing up your orders! when you buy from kitsch + fancy, you will know that every single item is 100% handmade from beginning to end by one person trying to live her dream! kitsch + fancy is my way of living life in a simpler way. just spending my days enjoying creating, cooking food, going on walks and spending time with my animals. i decided that even though i have been successful at other jobs, i just wasn't happy or interested working for someone else and building a career in the traditional sense. for me, success is enjoyment in what you do on a daily basis and i was happy to give up some luxuries to be able to pursue my dreams. i am so incredibly grateful for my lovely customers, friends, and supporters in my life that are helping live my dream! It is a joy for me to spend my days creating and brainstorming in my bright, colorful studio. The Kitsch + Fancy girl loves design, color, and femininity. A cozy home is just as important to her as the guests she has over. Visit my instagram at miss_sophiecakes to see my adventures with food, love, fashion, kitties, cooking and crafting. I spend my days creating everything in my colorful and sunny studio here in Charlotte, NC. I feel so blessed to be able to spend my days creating my goodies and running my own business. I love healthy cooking, walks with Sable, and decorating. 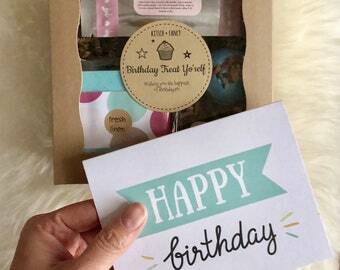 kitsch + fancy focuses on beautiful handmade products and most importantly CUSTOMER SERVICE! these policies and listings are general guidelines but if you need an item rushed, message me and i will do everything i can to get your item to you by your deadline. A RUSH fee may be added on a case by case basis. kitsch and fancy wants you to love all of your items. kitsch and fancy provides extremely detailed descriptions of each item including measurements and photographs with scale so you can clearly determine the size of the item you are ordering. Please make sure to take note of pictures with scale and measurements to make sure you are getting the size you want. Please ask all questions before ordering so you can be as informed as possible when making your purchase. If you are sensitive or particular about colors or scents I am happy to answer any questions or you are welcome to purchase sample colors/scents before making a large order. The items in the kitsch and fancy shop are MADE TO ORDER and most times not re-sellable. Buyer must contact to initiate return within 5 days of delivery and items must be shipping back in sellable condition within 14 days of delivery. For all returns or exchanges there will be a 20% restocking fee deducted from the return amount. Original shipping will not refunded and the return shipping will be paid for by the buyer. Orders with ANY type of customization are not available for return, this includes favors with custom labels. Refunds will be processed once items are returned in the same condition minus restocking fee and original shipping amount. Kitsch and Fancy is not responsible for lost, stolen, or packages delayed by the US postal service. Issues with shipment must be handled by the customer through USPS customer service. I accept Paypal or credit card via Etsy. Checks and money order may be accepted on a case by case basis--contact for inquiry. Checks, money order, cash accepted for local sales and we can arrange for pick-up if you would like to save on shipping--contact for transaction. HOLIDAY SHIPPING SCHEDULE: Last day to order for arrival by Christmas is DECEMBER 16. Anything ordered AFTER the cut off date is not guaranteed to arrive by Christmas unless we have communicated and I say I am able to get your order to you by a certain date. Feel free to message me if you want to order after the cut off date and we can arrange a rush order or expedite the order if possible. Happy Holidays!!! Kitsch and Fancy always strives to provide the best customer service and get your items to you in a timely manner. It is very important that the customer communicates via message or in the notes to check out the date your order is needed by, otherwise you will receive the custom order in the time period stated which is typically 4-6 weeks. The shipping date that pops up with your order is a general shipping timeline but if you have let me know the date or if we have discussed the date, it will be shipped by the date we have set. 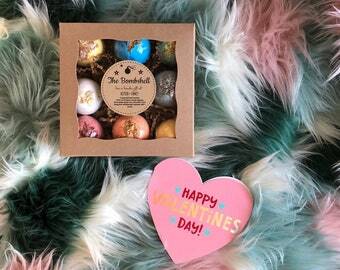 Most items (not including favors) are made-to-order and will be made and shipped within 1-5 days of receiving order and shipped priority mail (usually 2-3 business days shipping) thereafter. Shipping time will depend on stock levels and back orders but I always ship in a timely manner. If you need your items by a certain date, please contact me. Custom orders and wedding favor orders are at a 3-6 week turnaround, but I am super flexible and can get your order out quickly as long as we communicate via Etsy conversation. Feel free to contact for exact timeline for completion or for a rush order. A RUSH FEE to bump your order may be added on a case by case basis. Most packages are sent via USPS Priority Mail 2-3 days and 6-10 days international. kitsch and fancy is NOT RESPONSIBLE for mail that has been LOST, MIS-DELIVERED OR DELAYED by the post office. I guarantee that I will ship the mail by the date agreed upon to the name and address provided by the customer. If the package is held up, it is the customer's responsibility to contact their local post office to find the package. Kitsch and Fancy is not responsible for lost, stolen, or packages delayed by the US postal service. Issues with shipment must be handled by the customer through USPS customer service. Once we ship the order with the United State Post Office, the process is now in their hands. Unfortunately we cannot refund the shipping cost of your order. If a specific delivery date is requested, we will quote the time line that is given from the USPS web site. It is very important for the customer to provide the CORRECT NAME AND SHIPPING ADDRESS. kitsch and fancy is not responsible if the wrong name or address is provided so please double check that all of this information is correct. If you realize after purchase that the address you have provided is WRONG, please contact me asap. Etsy does not allow us to "edit" the shipping information so the order will have to be cancelled and repurchased with the correct information provided. Customers who enter the wrong shipping address, where the item is returned to us, will have to pay the additional ship fee. Items that are never returned where the wrong address is provided is at a loss to the customer unless you are able to get the package forwarded through USPS. Please follow the tracking number if it is provided with your order for updates on the delivery process. If any bumps in the road are encountered you will have to contact your local post office to find out where your package is. Please contact us if you have any questions. Please note that international shipping may be held up by your country's customs office, which is something we cannot control. The customer is responsible for understanding their local customs and for paying any additional fees that may be incurred during international shipment. If you would like expedited shipping please leave a message in the note box and I can send you a new invoice with the adjusted shipping costs. Anything over 13 oz will be shipped INTERNATIONAL PRIORITY MAIL FLAT RATE. If you would like to order multiple items, please contact with a custom listing for discounted combined shipping. Priority mail shipping takes 6-10 business days. There could also be additional delays due to customs. Kitsch and Fancy is not responsible for delays due to customs. I will do my end at making sure the package goes out by a date that I have confirmed with the customer. First-class mail can take up to a month for delivery. International customers, please contact me with what you would like to order and I can set up a custom listing with international shipping costs. Items shipped internationally are sent USPS Priority Mail shipping through the post office. I follow all the guidelines and procedures on my end to make sure your package arrives to you intact and on time. Please make sure you understand your countries shipping policies with receiving items like this. Kitsch and Fancy will NOT be responsible for items that are not accepted at customs due to customs regulations. Thank you! I am happy to customize your order for you. 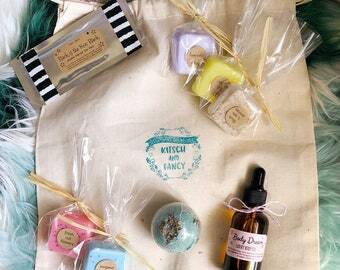 Leave your custom label information or scent request in the NOTES TO KITSCHANDFANCY box when you checkout. I am happy to work with my customerscwith any special request favors for your event, message me with the details and I’ll get back to you ASAP. 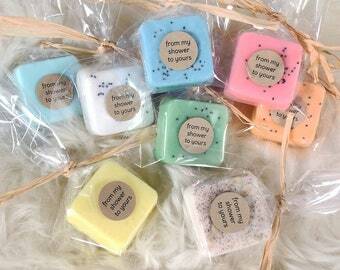 I proudly offer soap favors in many size and price options. 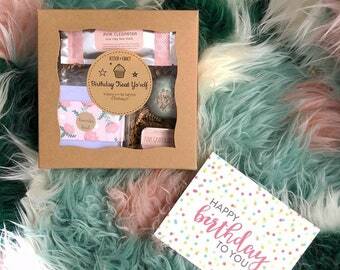 The soap favors come in a mini (less than 1 oz), a medium guest size (2 oz), a 3 pack stack (3 minis tied together), a full sized soap bar, and the 6 pack soap stack (6 mini soaps tied together). There is a favor for any budget you have. 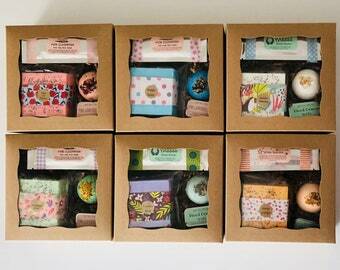 Each listing has very detailed information size, weight, and measurement of each soap. I provide many photos as well of each favor as well a few for scale (next to a ruler, in my hand, etc). I try to make sure my listings are as clear and descriptive as possible. Please make sure you understand the size of the favor you are purchasing and ask me any questions you have. 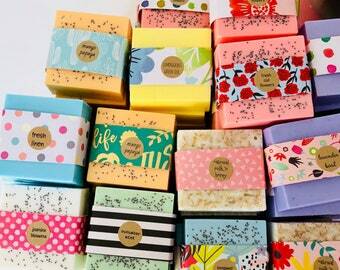 Keep your soap favors in a cool, dry environment to keep them from melting or collecting dust. Bars of soap should always be kept in a draining soap dish as well to prolong the life of the soap and keep it from getting mushy. If you would like to order a large amount of items feel free to contact me for bulk / combined shipping. Sometimes shipping your items together in a larger flat rate box can save you on shipping. I am happy to figure it out for you and set you up with a custom listing. International shipping from US to other countries is very expensive. I do offer international shipping on most items. Please look over my international shipping policies with all the details. The customer is in charge of any additional fees incurred with duties or customs. My item is a gift, can I include a card, gift wrap, and gift receipt? Yes to all of it! If your item is a GIFT, be sure to mark the GIFT box so it will print a gift receipt. If you would like to include a card with the order leave the message in the GIFT MESSAGE box and they will receive it with the exact message shown. Very important to double check that the correct shipping name and address are provided. I cannot change the info or re-route anything once it has been sent. I am happy to include an organic, stamped muslin drawstring bag with your order for only $5. 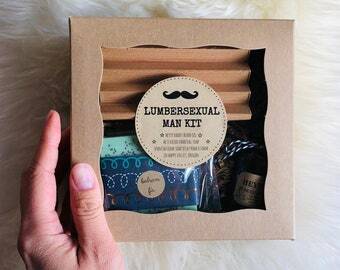 Just check the gift wrapping box and your item will include this lovely, reuseable item. 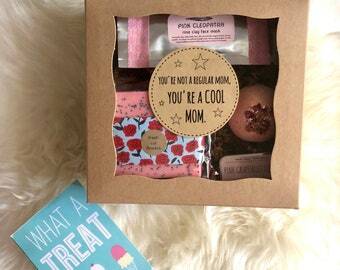 Check out the gifts section of my shop for ready-to-give boxed items like the treat box. I occasionally offer wholesale, contact me through Etsy or email sophiecakes@gmail.com for inquiries. 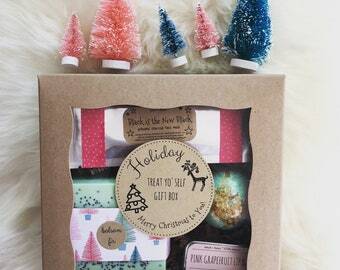 Can I choose different labels / colors/ soaps for my gift boxes if I am ordering multiple? Yes! Absolutely! 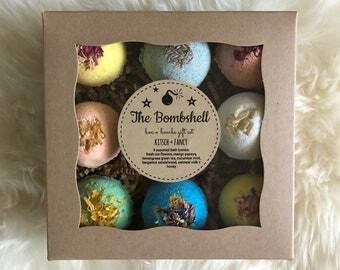 Just choose the listing with the number of gift boxes you need and then choose ASSORTED for labels and/or SOAP choice. You can leave any special requests in the NOTES box when you check out with how many of which labels you need. 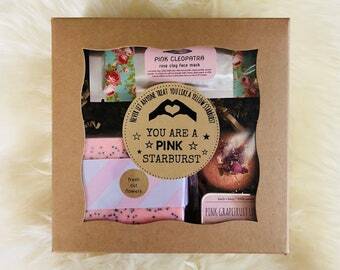 Any special requests with scents of items inside the boxes can be left here as well. Are all the gift boxes exactly as shown in the picture? kitsch + fancy has a fun, quirky style so I use an assortment of fun colors/ prints/ patterns to make all of my items (from scratch!) 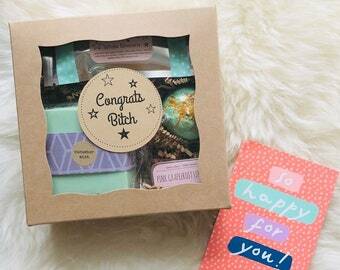 So no two gift boxes will look the same but I choose colors and prints that look super cute together. Leave any specific requests in the notes or send me a message and we can chat about any details you would like. I need my order ASAP, can you RUSH my order?!!! Yes and Yes! I can get almost any order to you as quickly as needed. Each listing will show you the estimated ship date but if you need your items sooner send me a message and we can work it out. Some orders will require a bump-the-line rush fee or overnight / expedited shipping charges to get to you in time.